I'm back after a bit of a hiatus. I held a class this past weekend and we played with products from the new Occasions and Sale-A-Brations catalogs - what fun! SAB features, an Occasions product and a PPA challenge! The first card we made features my two favorite items from Sale-A-Bration,, the Lotus Blossom stamp set (139143). This 3 step stamp creates a beautiful image for birthday, sympathy and thinking of you cards. See the video below for more details on this beautiful stamp set FREE to you with a $50 purchase during Sale-A-Bration. background to match or coordinate with any project. You can sponge it, spritz it or brayer it and the background pattern magically appears! This amazing DSP can also be yours FREE during SAB with a $50 purchase. Click here to shop. I did double duty on this card, it was a class project, but also used this week's PPA challenge colors in the layers of the flower. The sentiment and butterfly in this card are from the Butterfly Basics stamp set. The set is available in clear, wood mount and photopolymer. Need a catalog? Leave a comment below or contact me at RnRStamping@gmail.com and I'll pop catalogs in the mail to you. You may also peruse the digital catties by clicking on the icons in the right column on my blog. To learn more about the Lotus Blossom stamp set, check out this video - you'll definitely want to add this set to your must have list! Thanks for stopping. Stay tuned for more great projects from the Occasions catalog featured in Wednesday's Pals Blog Hop! Very pretty, Sue! I love how you used the Irresistibly Yours DSP for your background. It is such a gorgeous paper. The Lotus Blossom image looks great in blues! Thanks for joining us at Pals Paper Arts this week! 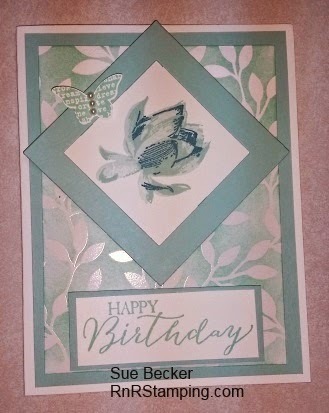 Sue, Love how you've used so many new products in this beautiful card! A true showcase of the two SAB items you've included. Thanks for playing along with this week's Pals Paper Arts Color Challenge.